Sunday was the first full weekend of the NFL season, something to which I look forward, with my Minnesota Vikings playing in the morning and their division rivals Greenbay Packers and Chicago Bears playing in the evening. Sweet! But my football binging experience was ruined by Governor Doug Ducey’s hateful ads scapegoating “brown people” and fear-mongering over the Mexico border, and a smear campaign against his Latino Democratic opponent, David Garcia. Arizona Republican candidates for office at every level of office are — once again, as they have in every election cycle since 2004 — running on anti-immigrant hysteria ala Russell Pearce and Jan Brewer and Donald Trump. Scaring old white people who vote Republican with scapegoating “brown people” and fear-mongering over the Mexico border is all they have. Sadly, this has too often succeeded in Arizona. There are a lot of scared old white people who vote Republican in this state. Governor Doug Ducey kicked off his reelection campaign by using your taxpayer dollars to film a campaign ad to praise his leadership on border security. Ducey uses taxpayer-funded event on border security to shoot campaign video. Arizona’s Governor does not want to talk about the teacher crisis in Arizona, Arizona teachers make 36 percent less than peers in other careers. Don’t forget that, or the GOP’s decade plus of underfunding public education in Arizona. Arizona’s Governor does not want to talk about how he supported the lawsuit by “Kochtopus” organizations – his benefactors who got him elected four years ago with a deluge of dark money – to knock the InvestInEd ballot measure off the ballot that hundreds of thousands of Arizonans supported. Arizona’s Governor does not want to talk about how his supposed 20 percent pay raise for all teachers does no such thing. 20 percent pay raise for Arizona teachers was 100 percent bull. 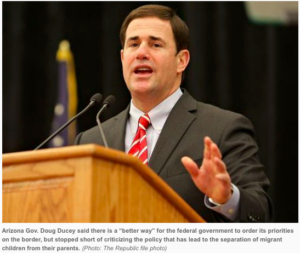 No, Governor Ducey has has embraced Donald Trump’s fake border ‘crisis’ as his ticket for reelection. Arizona sheriffs are revolting against Gov. Doug Ducey’s proposal to permanently fund a state border strike force to combat drug and human trafficking. In an open letter, the Arizona Sheriffs Association said years of inadequate funding for the state Department of Public Safety has challenged its ability to patrol state highways, oversee a crime lab and complete other core responsibilities. The group said the sheriffs’ ability to respond to border communities “has been severely hampered” because of the state’s sweeps of county funds. “Thus, before placing another responsibility on the Arizona Department of Public Safety by creating a ‘Arizona Border Strike Force’ we encourage the state to address the following issues, which the sheriffs believe to be critical, before implementing a new program,” the two page letter states. The association, which represents the state’s 15 sheriffs, says DPS should fill its 100 vacant positions with officers who can “adequately handle their regular patrols” on state roads, “relieving the counties of having to fill those gaps especially in rural communities.” The state should also improve its aging radio system “so that it is capable of communicating” with other law enforcement and emergency personnel, upgrade and fully staff the Arizona Counter Terrorism Information Center to vet intelligence information, improve the crime lab, which “is plagued by long turnaround times for evidence analysis” that affects timing of prosecutions, and restore funding to counties that have been swept in years past. “When you all passed the border strike force funding, it was $28 million-plus. The four (border) counties – Yuma, Santa Cruz, Pima, and Cochise – received just $1.2 million of the $28 million. That’s all we got,” Cochise County Sheriff Mark Dannels told the Senate Commerce and Public Safety Committee Monday. Pinal County Sheriff Mark Lamb joined that chorus at the Senate committee meeting. He told committee members that taking money from counties for state purposes hurts the counties. “Last year we took a $7 million hit, which equated to about a $1.8 million budget hit on our sheriff’s office. So we have to go through and find ways we are either going to eliminate jobs or find savings, and we have pretty much worked through all those savings,” said Lamb. Well it’s an election year, so in July Governor Ducey announced a $2.9 million funding boost for the Arizona Border Strike Force – far short of his originally proposed $28 million plus in 2015 – included in the state’s 2019-20 budget, which will add 12 Department of Public Safety troopers to the strike force to help it reach the goal of having daily around-the-clock coverage along the border. Funding boost will increase staffing for Arizona Border Strike Force. “In the 34 years I’ve worked in Cochise County, I’ve personally witnessed the evolution of border security,” Cochise County Sheriff Mark Dannels said at Wednesday’s event. Dannels said that developing a multiagency security initiative such as the Border Strike Force has helped counties more successfully protect the border. Pima County Sheriff Mark Napier said authorities estimate nearly 40 percent of the lethal narcotics that come through the United States illegally enter Pima County at some point. “We are on the front line of this battle,” Napier said. Properly funding county sheriff departments and the Arizona Department of Public Safety rather than diverting those funds to the governor’s personal Arizona Border Strike Force is a legitimate issue for debate, but that is not how it is being portrayed in Ducey’s attack ads. Governor Ducey’s attack ads also take issue with David Garcia’s opposition to Trump’s border wall. Let’s be clear: the reason Trump’s border wall has not been approved and funded by Congress is because of opposition from Republicans in Congress. Arizona Gov. Doug Ducey is putting some distance between him and Donald Trump when it comes to cultivating better relations with Mexico. [T]he governor said he does not believe a physical barrier is necessary. Republican Gov. Doug Ducey of Arizona said at a press conference on Friday that he thought there was a “better way” for the federal government to order its priorities on the border, but stopped short of criticizing the policy. It is the Trump administration which is illegally defying a lawful order of the federal court to reunify the families that they illegally separated under its zero tolerance family separation policy. But you don’t seem to have any problem with this lawlessness, do you governor? According to the most recent numbers, the Trump administration continues to have 497 children under U.S. custody, including 22 kids age 5 and under. The parents of 322 children have already been deported, including six kids age 5 and under. Under the previous update, the Trump administration had 528 children under custody, including 23 kids age 5 and under. The numbers are barely moving, and when every day in custody is another day of trauma, this is unacceptable. That represents a colossal and cruel failure on the part of this administration. But rather than focusing their energy on correcting that inhumane mistake, they are going to try another route to accomplish the same ends. The Trump administration said Thursday it is preparing to circumvent limits on the government’s ability to hold minors in immigration jails by withdrawing from the Flores Settlement Agreement, the federal consent decree that has shaped detention standards for underage migrants since 1997. The maneuver is almost certain to land the administration back in court, where U.S. District Court Judge Dolly M. Gee, who oversees the agreement, has rejected attempts to extend the amount of time migrant children can be held with their parents beyond the current limit of 20 days. Homeland Security officials say that will ensure that those families, many of whom are Central Americans seeking asylum, appear in immigration court. Allow me to translate what Sec. Nielsen is actually saying: According to this administration, the migrant families that are coming to this country to seek asylum from violence are such a threat to us that we need to be as cruel as possible to scare off future potential refugees. One of the ways we plan to do that is to toss out the standards for how we treat their children and detain them indefinitely because, otherwise, they won’t show up for court hearings that will order their deportation. Getting rid of the Flores agreement, which they refer to as a “loophole” rather than guidelines that protect migrant children, has been a priority for this administration from the beginning. Having failed to get Congress to eliminate it during the debates about DACA, it looks like they are just going to toss it and challenge the courts to do something about it. The result is that the administration plans to detain migrant families with children indefinitely, and we are supposed to believe that these folks will treat them with dignity and respect—even as they openly admit that this move is all about reducing the so-called “pull factor for illegal immigration.” In other words, it’s all about sending a message to potential refugees that they’re better off dealing with violence in their home country than coming here to seek asylum. Beyond the cruelty involved in all of this, it is important to keep in mind that everything this administration is doing on this front is based on lies. Just yesterday we learned that they summarily rejected data suggesting that refugees don’t pose a threat to this country. The Trump administration has consistently sought to exaggerate the potential security threat posed by refugees and dismissed an intelligence assessment last year that showed refugees did not present a significant threat to the U.S., three former senior officials told NBC News. There is also the lie about how asylum-seekers need to be detained in order to ensure that they appear in court. Empirical research has found, however, that asylum seekers fleeing persecution arrive predisposed to comply with legal processes and trust the system to provide them a fair hearing, even if they might lose. If the U.S. government treats asylum seekers fairly and humanely—i.e., releases them following their apprehension and provides legal assistance before their hearing—evidence suggests that they will be likely to appear for proceedings. Put simply, a humane approach can work. The message sent by this new initiative to abandon the Flores Agreement is that, even after the outcry over their family separation policy, the heart of this administration’s response to asylum-seekers along our southern border is to create an issue based on lies and then inflict cruelty as a deterrence. Governor Doug Ducey is OK with this cruelty to families, because his reelection campaign is built upon scapegoating “brown people” and fear-mongering over the Mexico border. It is long past time that Arizonans reject the overt racism of Republican campaigns in this state. Kick them all out of office! “The head of the local Border Patrol union is telling Hispanics they should not support David Garcia for governor simply because he also is Latino. So much for scapegoating brown people. The quote you cite implies that a Latino is “for lawlessness” without any basis in fact – clearly scapegoating this Latino candidate. Do you really believe that people of the same ethnic background cannot discriminate against one another? You are deeply mistaken and ignorant of history if you do. The only lawlessness clearly established is the Trump administration’s unlawful family separation policy and its continuing refusal to comply with a lawful order of the federal court to reunify the families unlawfully separated, something the Border Patrol Union is forced to implement because it’s their job. Earlier this year, 19 special agents with the U.S. Immigration and Customs Enforcement (ICE) signed a letter to Homeland Security Secretary Kirstjen Nielsen calling to eliminate ICE and shift its work to another bureau. The investigators “have been perceived as targeting undocumented aliens, instead of the transnational criminal organizations that facilitate cross border crimes impacting our communities and national security,” the letter states. More than a dozen ICE agents call to dissolve agency, http://thehill.com/latino/394757-more-than-a-dozen-ice-agents-call-to-abolish-agency. Are these ICE special agents also “lawless” for taking this position? Or is it only Democratic candidates running for office? For someone who has always stood alongside and supported the racist policies of Russell Pearce and Joe Arpaio, you are the last person with any credibility on issues of racism. The main point is that a union with many Hispanic members endorsed Ducey, which counters the anti-brown comment you made. Being against illegal immigration is not being anti-brown. It is being pro-law. If the laws are racist, then you’re a racist. Start locking up the employers and then get back to us. “In the real world, the most important issue in Arizona’s upcoming election is the ongoing assault on public education and how to stop it. But politics doesn’t care about the real world. In the imaginary world of political advertising – which often convinces individuals in the real world how to vote – the most important issue in Arizona’s upcoming election appears to be stopping that scary Mexican dude who wants to be governor. The ongoing advertising assault against Democratic candidate David Garcia is as ugly as it may be effective. Yikes … our children are at risk around Garcia? From there the lady in the ad makes fearful claims about Garcia that involve abolishing ICE (Immigration and Customs Enforcement) – a federal agency over which a governor has zero control – and fears about human trafficking and drug smuggling, which the ad seems to imply Garcia is OK with. All of the TV ads I’ve seen attacking Garcia play to fear and prejudice. But … it often works. Garcia is a fourth-generation Mexican-American. His father served in the military during the Vietnam era. Garcia went to Mesa High School, after which he, too, enlisted in the Army. He later graduated from Arizona State University then went on to earn a master’s degree and a doctorate. He is married. He and his wife have two young daughters, just like the woman in the attack ad. I’d guess that keeping his children safe is as important to him as it is to the woman in the ad. Plus, Garcia, by way of his extensive academic background, knows an awful lot about education. Which is the most important issue in Arizona’s upcoming election. In the real world, anyway. First, I would try to keep families together, so long as one is not a criminal. Second, where was the rage when Obama did this. The infamous caged kids picture was during Obama’s administration. Third, pointing out Garcia’s stand on ICE and walls is legitimate. Only his backpedaling is illegitimate. 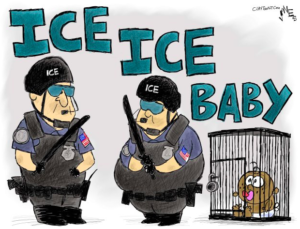 Garcia’s stand on ICE is the same as ICE special agents who have petitioned DHS for reforms to the agency, and Garcia’s stand on Trump’s border wall is exactly the same as Governor Ducey – they are both opposed to it. Gov. Doug Ducey and his pals are getting one message right in their vicious attacks against David Garcia: Don’t vote for him because he’s a Latino. “Don’t be fooled just because a candidate has the same surname as another Hispanic person,” Art Del Cueto said Monday at a press conference as reported by Howard Fischer of Capitol Media Services. Del Cueto, the head of the local Border Patrol union and officer of the National Border Patrol Council, is the latest to tout Garcia’s ethnicity to provoke fear among Arizonans and distrust among Hispanics. Ducey’s pals couldn’t have said it better, really. Nobody should support Garcia’s bid for governor just because he’s Latino. What are Ducey and his pals afraid of? Arizonans should take him seriously based on his qualifications, his political proposals and the content of his character. 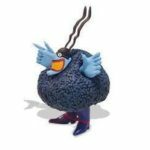 He has a doctorate from the University of Chicago. He’s an Army veteran, a respected university professor, a father of two daughters and a husband of an accomplished corporate lawyer. And don’t forget that this is the same Democrat that Ducey’s pals at the Arizona Chamber of Commerce and other Republicans once hailed over a Republican for superintendent of public instruction. Garcia failed in his 2014 bid for schools’ chief. Yet Ducey is terrified he could unseat him? Only fear explains the television ad depicting Garcia as a demon who’s going to open the southern Arizona-Mexico border to dangerous criminals who’d be out to harm white families. Only fear explains pulling Latinos like longtime Democratic strategist Mario E. Diaz and the likes of Del Cueto to say nice things about Ducey and to caution against identity politics – the tendency of people of a particular religion, social background or race to form exclusive political alliances. Surprised? It’s a fact that most of Arizona’s 3.6 million registered voters are white, and it’s a fact that statewide elected offices are currently held by white Republicans. Latinos make up a third of Arizona’s population, but only a fraction of that are actually registered to vote. That means, logically, that no Latino candidate can get elected to a statewide office solely with Latino votes. A fighting chance requires appealing to the broader electorate. That might explain the attacks against Garcia as the governor who’d flood Arizona with illegal border-crossers to hurt the white family – as depicted in the television ad. Never mind that the federal government is the one responsible to protect the U.S.-Mexico border. Never mind that Ducey and his administration have proudly and loudly touted Arizona’s trade with Mexico. Never mind that Ducey himself touts a personal friendship with the governor of the state of Sonora, Mexico. Those are good things the governor has done to promote and foster a better economic and political relationship with Mexico. But you won’t see any of that now. Instead, you’re seeing 30-second television ads depicting a governor who’s tough on border issues. Ads that attack the Hispanic who some want you to believe is a threat to white families. Now tell me, who’s really playing identity politics in this governor’s race? Wait. Identify politics is thriving in Arizona? If so, it isn’t just among Latinos. It’s actually more evident among white Arizonans. John Kavanagh forgets that Obama was called “The Deporter in Chief” and lots of us were outraged. And I would remind John Kavanagh that only fixing our immigration laws will change any of this, and that the GOP has been in control of Congress since 2010. So, blaming Obama is disingenuous. I would also like to remind John Kavanagh that Obama is not the POTUS, and that the GOP controls 30 states and the Federal Government. So the problem is 100% your party’s problem. Ducey is a racist, like everyone in the GOP, and the family separation issue should be at the top of the news every f’n day. Over the last two months I’ve watched TV hosts and listened to radio hosts cry as they interview parents and children on the border. These people cover wars, bombings, disasters like earthquakes where people are trapped under rubble, violent crime, atrocities from all over the world, and what’s happening on the southern border of America is too much for them. History will not be kind to Trump’s GOP.